Saturday I return to work. Which means I return to Europe. And either eat and drink in celebration or disappointment of the season passed. to take you to a new one. One you have to make for yourself. Because the place you once called home never really was. So my offseason was less homecoming and more self discovery. It takes a week of catching up on sleep, and another week of getting treatment so my body could understand I wasn’t asking it to do anything intense or painful. I think I want to go to Ohio. So I went, and once I got there I decided that my niece and I would go to NYC and see a Broadway show. Both of us have a love of theater, and although her career has progressed well beyond mine, it’s not an experience I want to relegate to a past life. So I honored "Little Tee" who used to only sing replies when people would talk to her, who would try out for solos in choir and get them just to chicken out on the day of the performance, who even now still belts songs from Phantom of the Opera from well placed balconies. 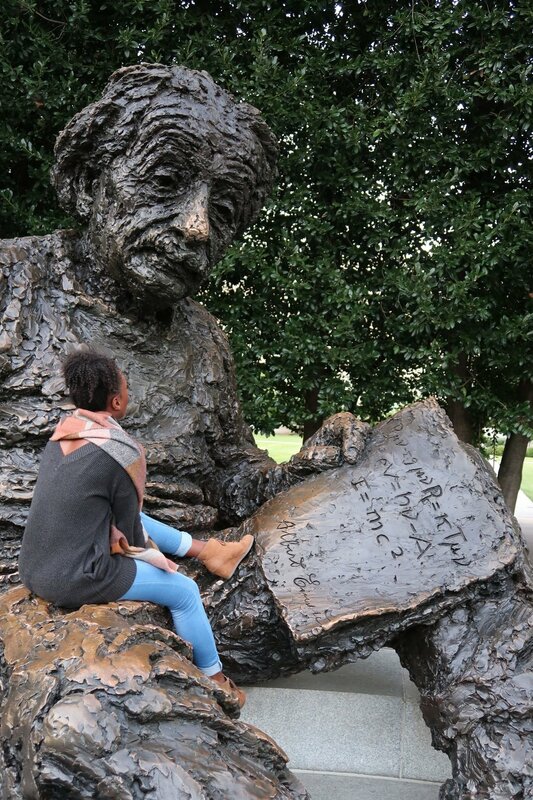 But then the nerd in me wanted to go to Washington D.C. that trip had been an unfulfilled promise to me for years. I’ve always wanted to visit the nation’s capital, but most of all I wanted to visit the Smithsonian Museums. I had heard great things about the National Museum of African American History and Culture so chose that one. I can’t even begin to articulate what experiencing that museum was like. and encouraged by so much. I thought it would make me angry…the story of my ancestors. Coming face to face with atrocity after atrocity uninterrupted for hours and hours. I thought it would send me down the rabbit hole of depression and self pity maybe even make me angry with white people, especially men both past and present for the treatment of my ancestors, of me. I can pinpoint the moment it happened. We were in a room with remnants of recovered sunken slave ships, the room was dimly lit as if we were in a cargo hold ourselves, chains, wooden planks, and dioramas flanked us on both sides. Different blueprints for how one can arrange the slaves to maximize capacity. A small sign so nondescript I almost missed it entirely. I’m standing here, because someone who’s name I’ll never know, survived. Someone who’s blood I share, had a level of strength I can’t even begin to imagine. Someone who had the unimaginable happen to them, who lived a daily unending nightmare, found a way to put one foot in front of the other, start a family, survive, thrive. Like Kendrick Lamar would say. I caught a glimpse of my reflection in the glass of an exhibit. 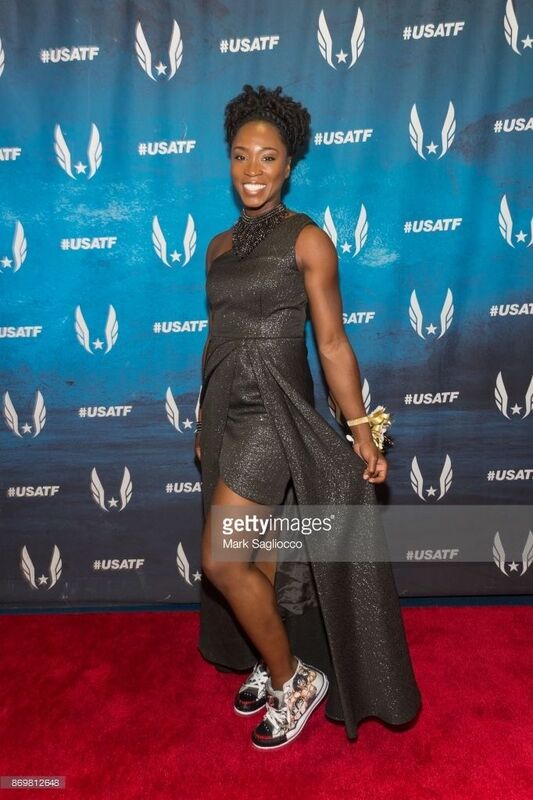 Fast forward a couple weeks and I’m on the red carpet at USATF’s Black Tie and Sneakers Gala discussing the season and my shoes. There were a few moments this off season when I felt like a failure. But there were plenty more moments this off-season when I felt like I’d hit the jackpot. I was able to reconnect with old friends, like Jebreh Harris who still had copies of the poems I used to write. He had me read them again and I felt like I was being reintroduced to myself. I was surprised at the tears that welled in my eyes as I read. In a word everything was: wonderful. 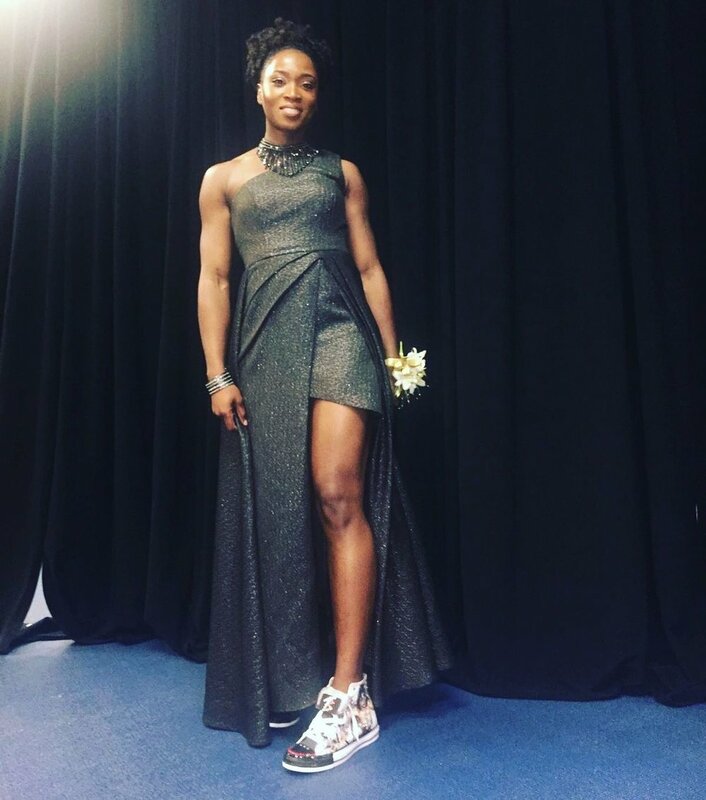 So when it was time to attend the gala I wanted my last off season event to be a culmination of everything I felt and learned about the past year and season. became a symbolic, sentimental, and meditative exercise for me. Each time I painted the wrong spot with the wrong stroke, or super glued a crystal in a weird place I giggled, or cursed, or exhaled a frustrated breath and slammed my brush or tweezers down and called it a day. 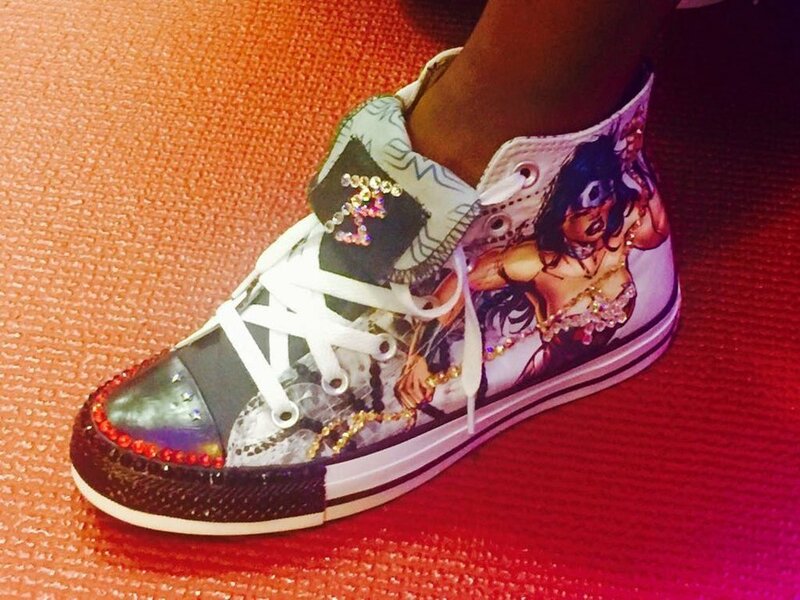 Those shoes are so me. The experience of this year would die if I didn’t share it with you. Same is true with supporting the next generation of track stars. So it seemed only fitting to auction them for charity, so that a few more dollars can be added to the coffers that support youth athletics in this country. This off season has been so fulfilling, not because I was off, but because I was on.